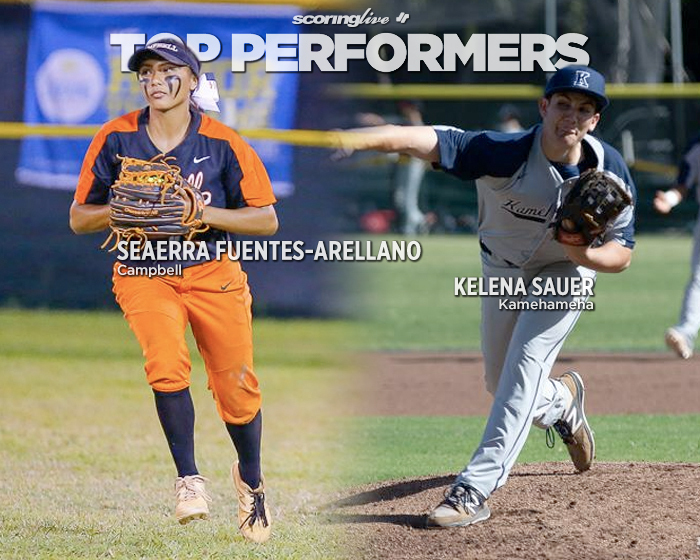 As far as surprises go this softball season, there may be none bigger than the Mid-Pacific Owls. 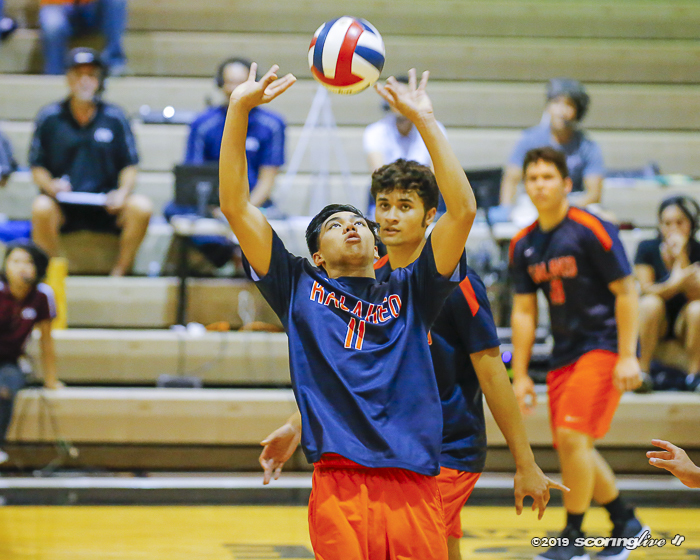 Mid-Pacific, under first-year coach Aiko Gojo, has put together a 6-1 record in the regular season and currently sits in first place in the Interscholastic League of Honolulu's Division I standings. The first-half success doesn't come as a surprise to Gojo (formerly Okamura). "From the first day of tryouts the girls have worked hard and they're good players, they know the game, so we're very blessed with all the talent we have," said Gojo, who had a standout prep career at Roosevelt before playing for the University of Hawaii from 1995-'98. Gojo, a middle school Japanese language teacher at Mid-Pacific, started her coaching career as an assistant at her alma mater. She also taught at St. Andrew's Priory and was head coach of the combined Saint Francis-St. Andrew's-Hawaii Baptist team. Most recently she was an assistant at Punahou before taking a hiatus from the game. "I was coaching ever since I stopped playing at UH, so I've been around high school softball for a long time," Gojo said. "I took a little break when I had my children and then decided to apply when the (Mid-Pacific) opened was posted," Gojo said. "I'm excited about our season so far. We've been hitting the ball well and playing good team ball." Hitting the ball "well" is a vast understatement. Mid-Pacific leads the state with a lofty .475 team batting average. It has slugged 39 extra-base hits this season, including 15 home runs. The top of the lineup has been especially productive. Junior leadoff batter Mahea Perkins is batting .455 and sophomore Zoe Oshiro, who bats in the No. 2 hole, is hitting at a .478 clip. They are tied for the team lead with 14 runs scored. Junior catcher Keao Takemura, who is batting .647, has collected three hits in each of the Owls' last two games, including a six-RBI effort in a rout of Damien last Saturday. "They're huge. We count on them to set the tone," Gojo said. Sophomore Darrian Kanno leads the team in batting average (.632), hits (12), runs batted in (14) and home runs (4) and has hit safely in every game this season. She also has recorded the most innings pitched (19 1/3), wins (3) and strikeouts (17). Lea Hanawahine, the lone senior on the team, is hitting .478 and is 2-0 in the pitching circle. "They've been alternating starts. We discuss who's gonna start and we have a plan and then we just see how the game goes and we just make adjustments. I would say they're very similar in the sense that they want the ball, they want to throw, they want to keep us in the game," Gojo said. "Lea, this is her last year playing high school softball, so she wants it." The Owls have reeled off four consecutive wins since their lone blemish this year: an 18-8 six-inning loss to Iolani on March 4. They are averaging more than 14 runs scored per game and have plated double-digit runs in all but two of their contests. 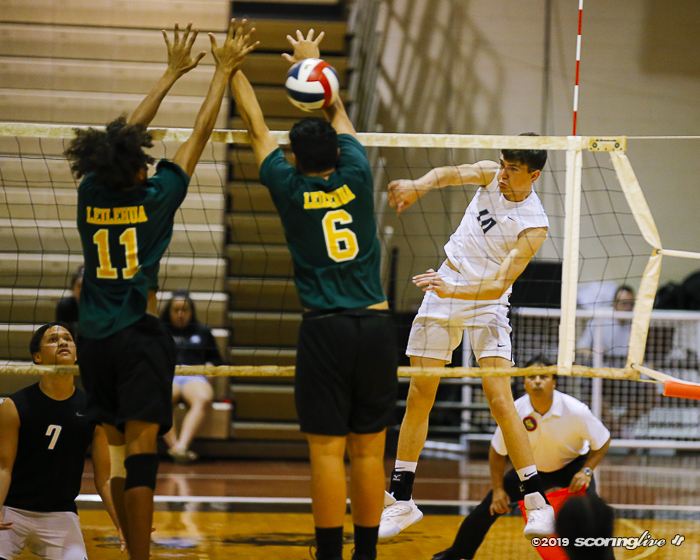 Three of their wins have come in come-from-behind fashion — including Wednesday's 13-11 road win over Kamehameha — and two of those have been on seventh-inning walk-offs. "These girls are resilient and every day they're ready to practice hard. They play through injuries, they play through sickness; they just want to play," Gojo said. 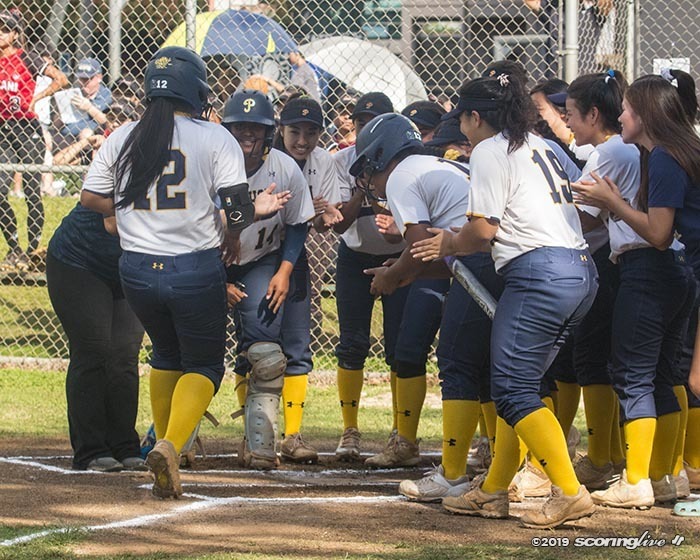 Gojo pointed at one of those walk-offs — a 15-12 win over Punahou on Feb. 27 — as the most beneficial game for her team this season. 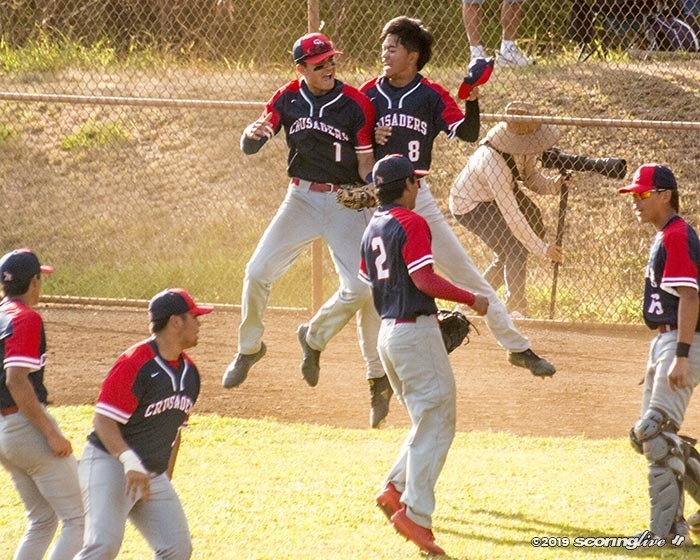 Mid-Pacific overcame a 10-0 deficit after four innings to turn back the Buffanblu. "It validated what we already knew," Gojo said. "We know we have a good team and to come back from down 10 (runs) to win just shows that we can play." Meanwhile, the Mid-Pacific's opponent Saturday, No. 6 Maryknoll, will be looking to get back in the win column after having lost two of its last three games. 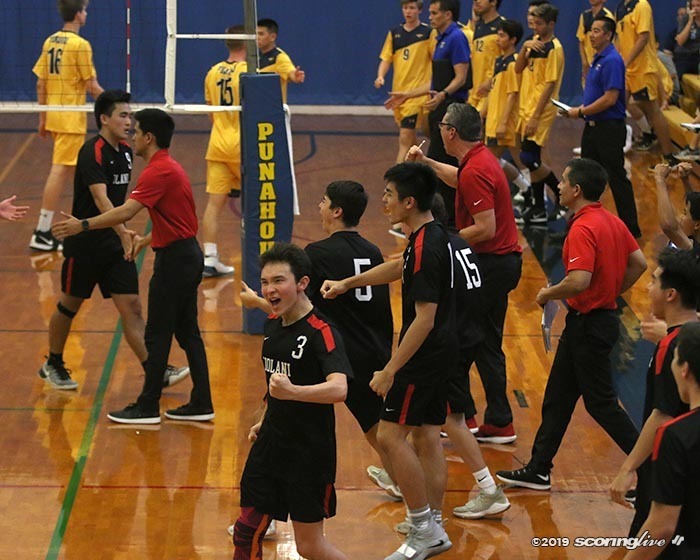 The Spartans, who are coming off a 6-4 loss to eighth-ranked Iolani Tuesday, enter the weekend tied with Punahou and Iolani at 5-2 for second place in the league standings, one game behind the Owls. 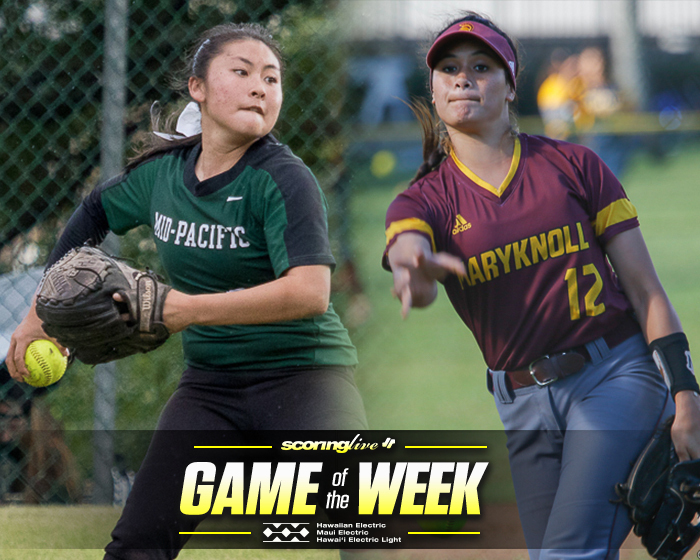 Maryknoll, the two-time defending ILH D1 champion, opened the season with an extra-innings victory over last year's state runner-up, Punahou. It won its first four games before suffering a 2-1 loss to Division II-PAC-5 last week Thursday. In their five wins, the Spartans averaged more than 14 runs scored per game, however, they have been held to five total runs in their two losses — which have come by a combined three runs. They managed just three hits in Tuesday's loss to the Raiders. A pair of freshmen set the tone at the top of the batting order in leadoff batter and outfielder Breli-Rylin Agbayani-Shibao and No. 2 hitter and shortstop Carys Murakami. Agbayani-Shibao is batting .462, while Murakami is hitting a gaudy .655. Murakami went 5 for 5 at the plate with a home run, two doubles, five RBI and three runs scored in a last Saturday's win over Sacred Hearts. In the pitching circle, Maryknoll has relied heavily on sophomore Aloha Akaka, who ascended to the role of staff ace this season. She is 3-2 on the year with a 4.84 ERA. In 37 2/3 innings of work, Akaka has allowed 27 runs — all but one of them earned — on 42 hits with 21 walks and 13 strikeouts. Saturday's game will be the first of two regular-season meetings between the teams. They play again on Apr. 10 at Mid-Pacific. First pitch Saturday is scheduled for 3 p.m. at Sand Island State Recreational Park.